When her father is sent by his doctor to Arizona to recover from an illness, high schooler Beany Malone is left with instructions to look after her siblings. These include Mary Fred, her beautiful sister, who wants nothing more than to be accepted by the members of her preferred sorority, Johnny, who is consumed with the work of helping an aging journalist named Emerson Worth finish his life's work, and Elizabeth, who waits day in and day out for word of her soldier husband whose fate in the war is still unknown. In addition to trying to prevent anything even remotely negative from infiltrating her family's life, Beany also struggles to sort out her feelings for Norbett Rhodes, whom she likes very much but fears may be using her to get to Mary Fred. 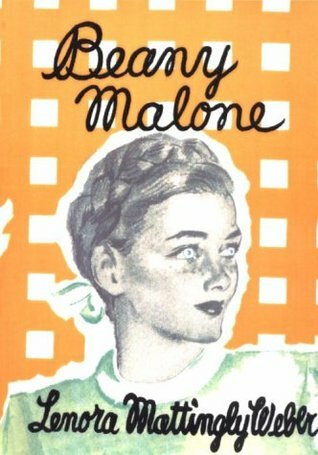 Beany Malone is the second book in a series about the Malone family. I normally don't start with the second book of a series, but it's the only one I have access to right now, and I couldn't resist it, especially once I started reading. It reminded me instantly of the later Betsy-Tacy books where the characters are finishing high school, finding spouses, and venturing out on their own. It also reminded me quite a bit of Winterbound. Somehow, though, Beany is more real to me than the characters in any of those other titles. Her approach in protecting her family and in relating to others in general is very flawed, and she often makes big mistakes that cause more problems than they prevent. I think most young teens, the likely audience for this book, would really relate to her because how she behaves is also how they would behave in the same situations. She is very human - sometimes painfully so. Beany is a character I would have loved in middle school, and who still appeals to a particular aspect of my personality, even now. I really hope to gain access to the other Malone books so I can get to know the other siblings better and follow Beany's antics as she continues to blunder on the road to maturity.